One idea just leads to another. 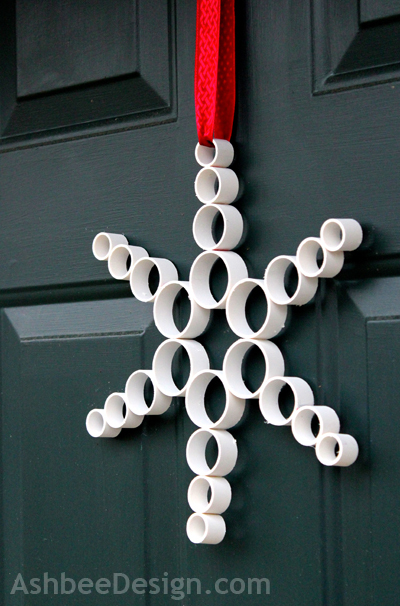 When I made my PVC snowman I was fiddling with the shapes after having glued them together. I arranged them in a circle and voila! I saw a star. My next new project was discovered just as easily as that. I took PVC piping in four diameters, cut it into 3/4" slices, glued them together in stacks of four, and then glued the stacks into a circle. Very easy, quick and contemporary. If I had more time I think I'd try another version with 5 sizes of PVC, and two layers of rays. Always seeing more possibilities. Side note: People are always asking me what color paint was used on our home. I'll address that right up front before the questions come in. The house is stained using Benjamin Moore Arbor Coat solid stain in Amazon Green (Benjamin Moore 2136-30). 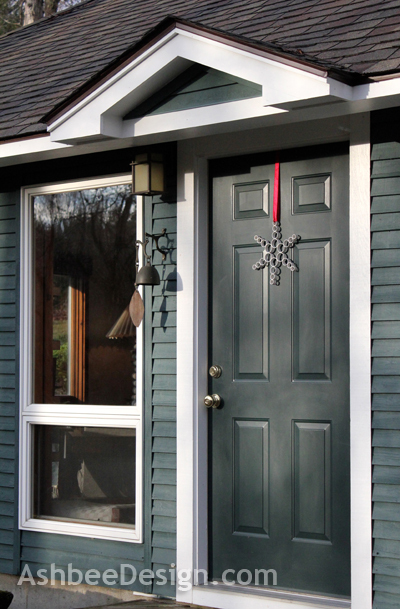 The doors are painted a little darker using Regent Green (Benjamin Moore 2136-20). Trim is Brilliant White. We love the combination. PVC Pipe in 4 different diameters. I used thin walled PVC in diameters of 1.5", 1.25", 1", .75"
Saw - I used a band saw but this could easily be completed with a hand saw and miter box. 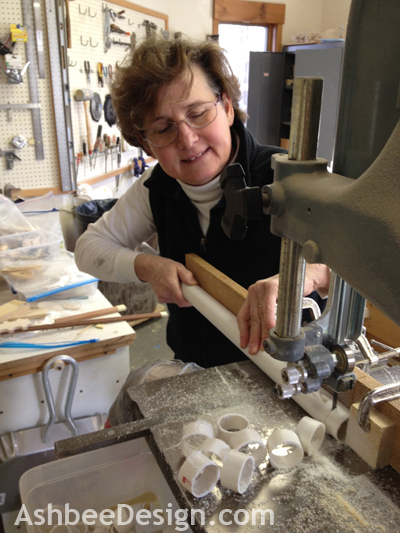 Cut 6 3/4" thick slices of each size of PVC piping. I used a band saw because I have one but you could easily do this by hand using a miter box. PVC is relatively easy to saw by hand. Use sandpaper and sand off the plastic fringe that forms when cutting. 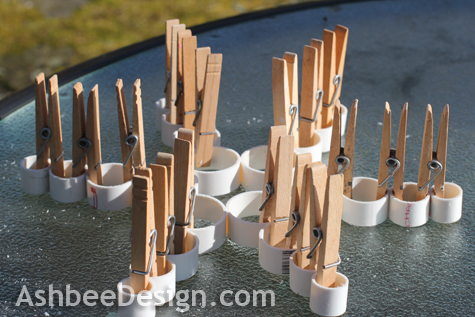 Working in a well ventilated area, glue the rings together in strips of four. Glue them in size order, 1 each of the 1.5", 1.25", 1" and .75" sizes. The PVC cement comes with an applicator. The directions say to work in temperatures above 40º and to apply the cement to both surfaces and then hold together for 30 seconds. I used clothes pins to hold them together so I could keep moving. Cement all 6 groups of four together in a circle being careful to space them equally. PVC cements bonds quickly and there is no resetting later! Use cloths pins to hold them. 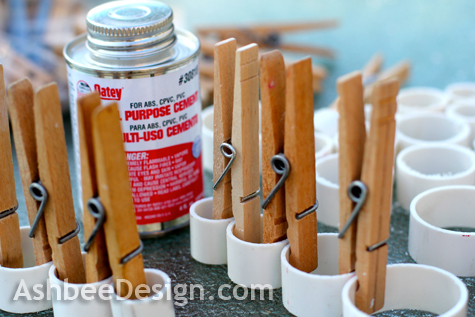 Once the cement is set, remove clothes pins. 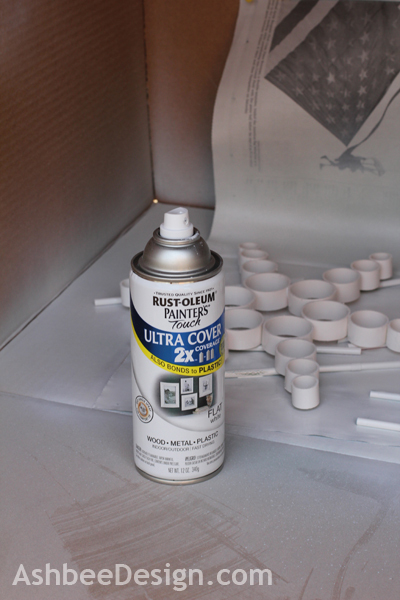 I set-up a spray booth outside for ventilation. It was 60º in Connecticut - otherwise I would have to wait until spring to spray paint! 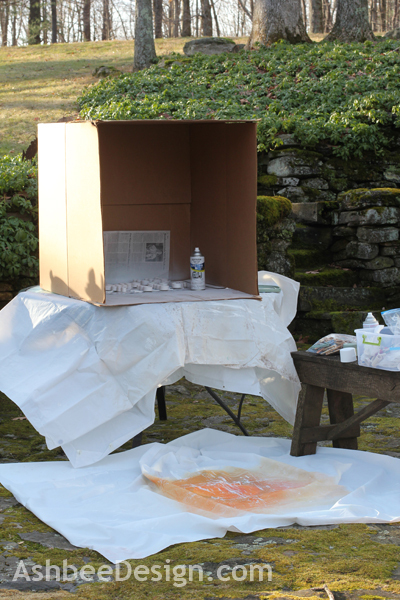 There was a breeze blowing so I used a carboard box for my temporary spray booth. I also use old shower curtain liners as drop clothes when I spray. I find it amazing how far the spray travels. I didn't want a white spray film on my stone patio! 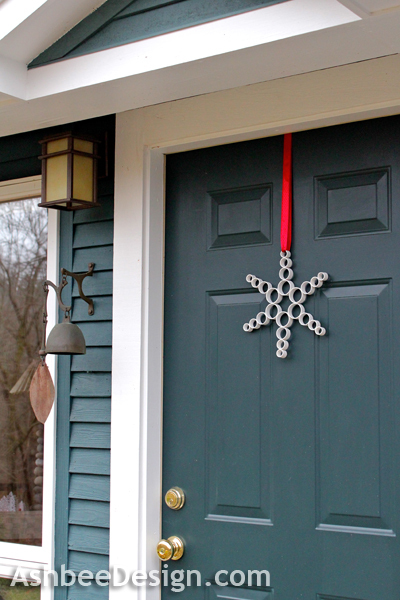 When dry I added a bright red ribbon and hung the star on my door. Still need some Christmas Greens in containers on either side. Christmas decorating is a 25 day process for me. A little goes up everyday for the month. This is adorable! I love the simplicity of it. Have a great week! It is so easy to over do a project. Although I tend to rustic decor, every so often I see something simple, clean and contemporary and I just love it. Like this star. I think it is the Scandinavian in me! another great idea! love it! Thanks Mel, Nothing like roaming around a hardware store or Home Depot to get craft inspirations! All kinds of nifty things to be used in new and creative ways. My husband and I have dates to Home Depot to go and roam and be inspired. Thanks! It was easy so give it a try. PVC has so many possibilities but it is less about the material and all about the basic circle.